You’ve probably admired Kent Riches’ work before without knowing it. That’s because his company, Air-Tech Streamlining, has been producing high quality bodywork since the ’80s—for everyone from garage builders to factory race teams. Starting with the bodywork, Kent stretched the original tank six inches before making a mold and reproducing a lightweight fiberglass version. Another mold was made for the tail unit, mimicking the rear curve of the tank. 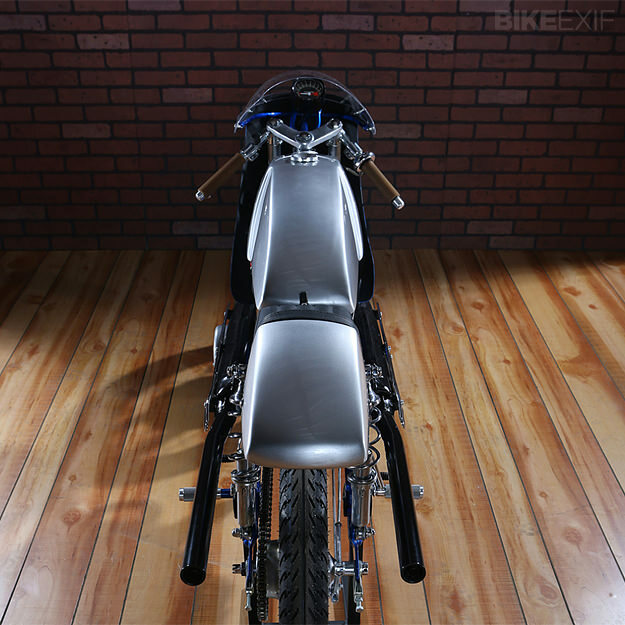 To balance the Suzuki’s lines, Kent installed a fairing that he’d originally designed for a Honda project, fabricating new fairing mounts himself. He also custom-made a set of clip-ons and rearset foot controls. A shouldered Akront rim was laced to the Stinger’s front end, and a T500 dual leading shoe brake machined to fit. Kent also machined the rear brake backing plate. 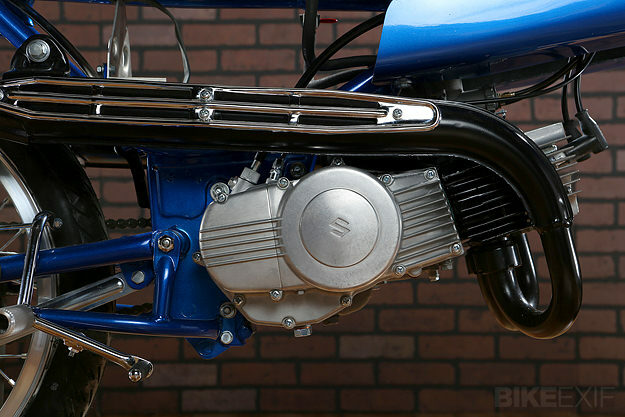 The Stinger’s two-stroke parallel-twin motor was stripped, media blasted, inspected and re-assembled with oversized pistons and new gaskets and seals. 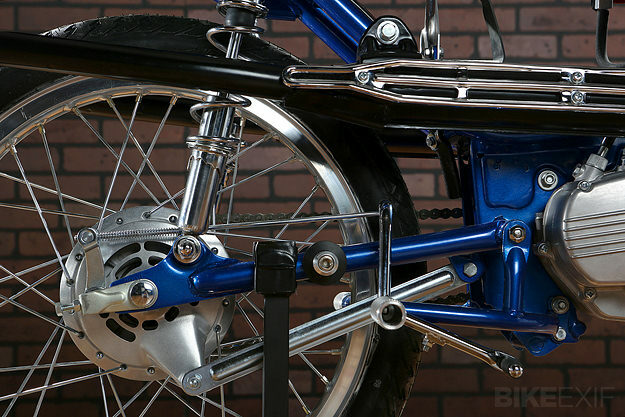 The 27mm front forks were rebuilt and a pair of YSS shocks added at the rear. Kent also replaced the swingarm’s rubber bushings with bronze ones. 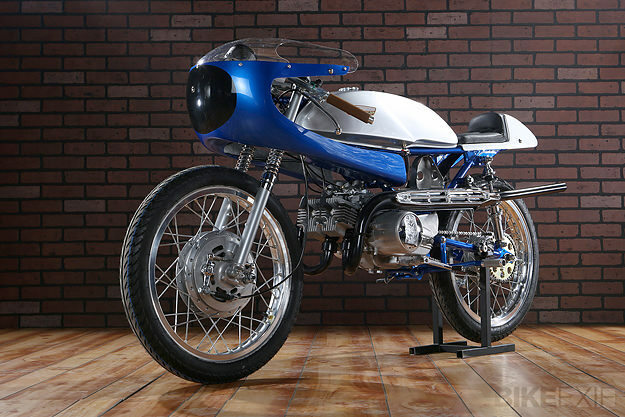 A striking candy blue adorns the fairing and frame, offset by the silver tank and tail. 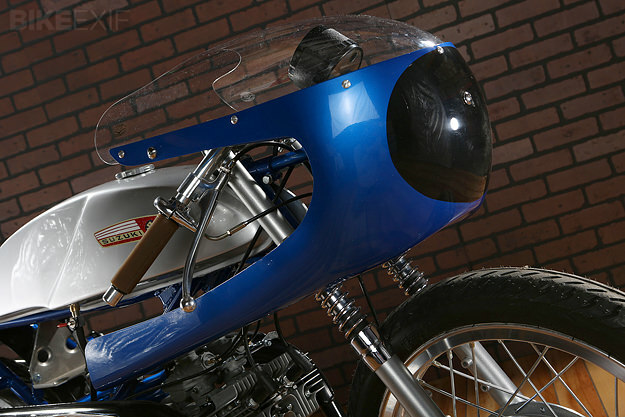 Rather than simply machine polishing or powdercoating parts, Kent combined bead blasting, soda blasting and ball burnishing—“It makes the parts look like they would have come from the factory.” He even went as far as to have waterslide decals made for the tank, inspired by ’60s race bike badges. 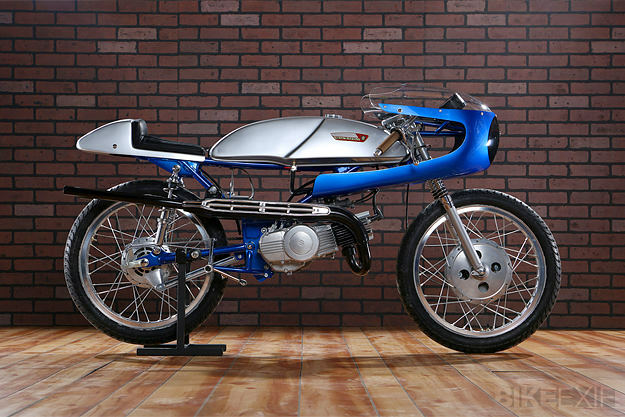 With so much consideration given to authenticity, Kent’s T125 could easily be mistaken for a restored vintage factory race bike. And I’m sure he’d be happy with that. See more at Air-Tech Streamlining.